With Money Dashboard's free budget planner, you can quickly see the areas of your financial life where you might be spending more than you want to. Sometimes just getting visibility of these figures and trends can be enough to spur you into action, but sometimes it's useful to have some targets! Recently, we've introduced the 'Spend Tracker', which you can find in the 'Future' section of Money Dashboard. Here you can set up target limits for areas of your life you want to get control of and track how much you spend in those areas throughout the month. See a historical view of previous tagged activity providing a comparison to your current trackers. Have the ability to create trackers on groups of spend tags. Personalise your trackers by giving them meaningful names and colours. To take advantage of these new enhancements, visit your Spend Tracker now. 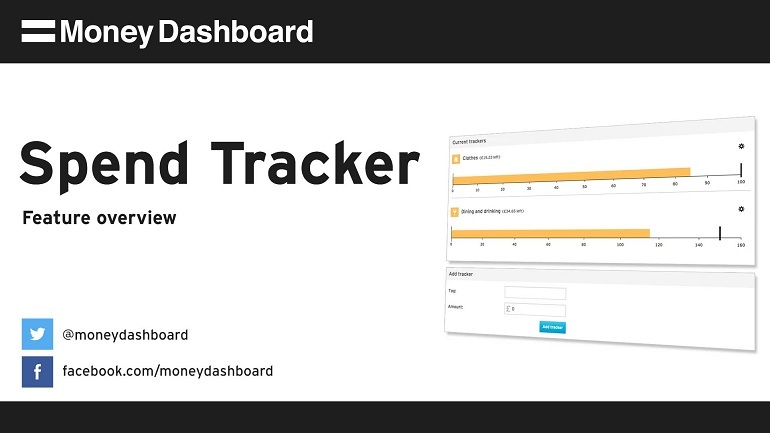 Take a look at our video overview which Money Dashboard's Lisa Venter has pulled together to help you get to grips with our new spend tracker. Using the spend tracker can help learn how to budget money and achieve your financial goals - whether that is saving for a mortgage or just to go on holiday. First, select the tag against which you want to start tracking. If you know what you're looking for, the quickest way to do this is just to start typing the name of the tag in the field and it will automatically bring up tag names for you to choose from. Anytime throughout the month, you can edit your trackers to help you get to grips with budgeting. Just click on the 'cog' icon to bring the tracker into the 'edit' state. Here, you can change the tag you're tracking against, or the amount you want set as the target limit. You can see the exact spend on any of your trackers by hovering over the orange bar.